Almost every seaside village between Wells and Lowestoft had a company of beachmen. These companies made it their business to go to the aid of any ship in distress, and whatever the weather or risks involved, the flare of rockets and boom of minute guns from a stricken vessel never went unheeded. There was great competition between companies, for the first men aboard could claim right of salvage. On reaching the vessel, and before rescue began, terms of employment were settled, and the beachmen drove a hard bargain. But their work was arduous and fraught with danger, and on many occasions they earned nothing at all. By the middle of the 19th Century Happisburgh fishermen had formed a company, and by the 1870’s had acquired a fast sailing yawl, Friendship. She was built at a cost of £160. Some money was subscribed, but each of the 28 men who had part ownership contributed £5-10 shillings. (Their average weekly wage was about 12 shillings). A crew of 13 manned her. Dragging the yawl 200 yards over loose sand at low tide and launching her through the breakers was no easy task, and hauling her ashore and up the Gap took a full 2 hours. 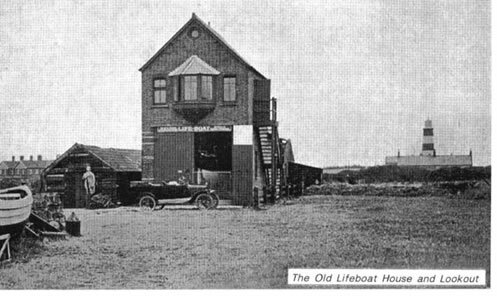 The Royal National Lifeboat Institution established a station here in 1866, but the lifeboat, also manned by beachmen, was one of the smaller class usually working inshore, so it was the Friendship who generally went to the assistance of vessels stranded on the Haisbro’ Sands. 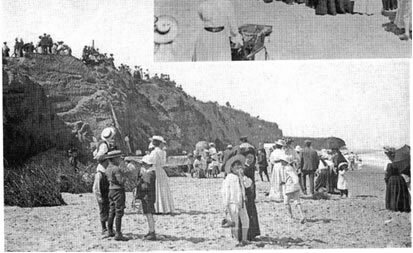 The beachmen also collected all salvageable goods washed ashore. 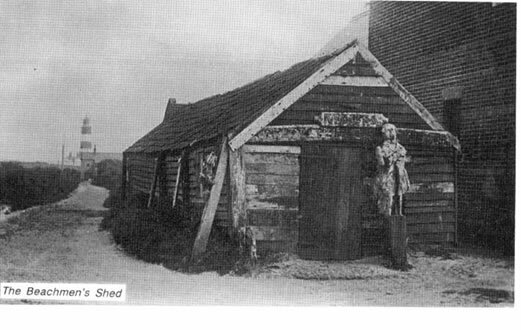 Their headquarters and storehouse was a shed on the cliff top beside the old Lifeboat house. For many years a large and colourful ship’s figurehead washed up from a wreck stood by the doorway. C1903. Happisburgh Band of Hope in front of the Yawl Friendship and one of the original Coastguard houses. The Norfolk Association for Saving the Lives of shipwrecked Mariners’ was formed in November 1823. 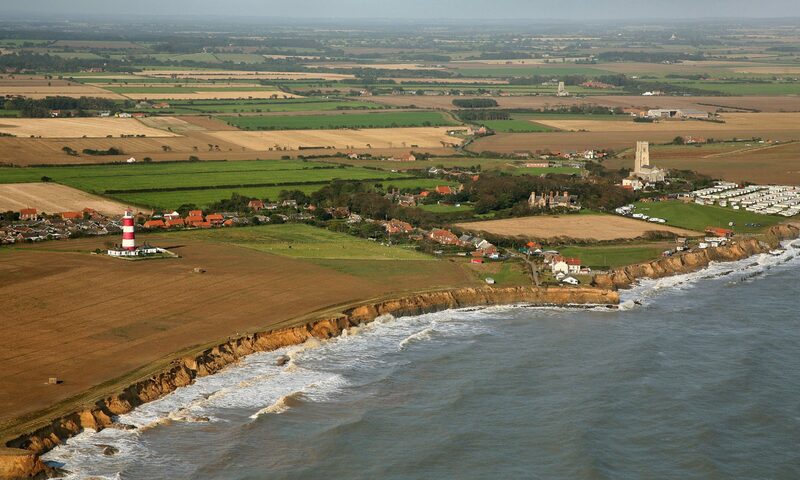 Lifeboats were stationed along the coast, and in 1858 were taken over by the Royal National Lifeboat Institution, who established a station at Happisburgh in 1866. THE HUDDERSFIELD, paid for by the people of that town at a cost of £406, arrived here in August of that year. She was a 32 foot self-righting type pulling ten oars. Near disaster struck in 1884 when she went to the aid of the schooner Edith of Padstow, wrecked just offshore. As Huddersfield approached the vessel she was swept across its deck. The shore party manned a rope and succeeded in pulling her off, but overturned, throwing out the crew. Two swam ashore and the remaining eleven managed to regain the boat. HUDDERSFIELD 2 was a replacement in 1887, also provided by the town of Huddersfield. THE JACOB AND RACHEL VALLENTlNE, the last offshore boat, was sent to Happisburgh in 1907. She was named as desired by the donor. Mr Vallentine, a prominent member of the Jewish community in Brixton. In his will he requested that a lifeboat be stationed on the East Coast within one year of his death. In 1926 the RNLI decoded to close the Happisburgh station. It was thought that the motor lifeboat at Cromer could cover this area adequately, and the Jacob and Rachel was moved to Sea Palling. 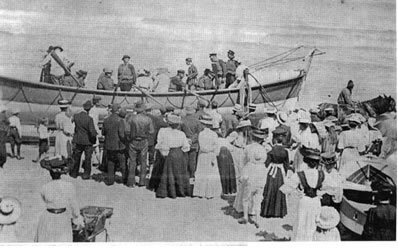 The Lifeboat Crew was called out by a runner shouting, “Ship ahoy!” This cry summoned horses from neighbouring farms as well as men, for their help was needed to launch the boat. Two horses pulled the boat-carriage down the Gap while the crew and onlookers hauled on ropes behind to act as a break. 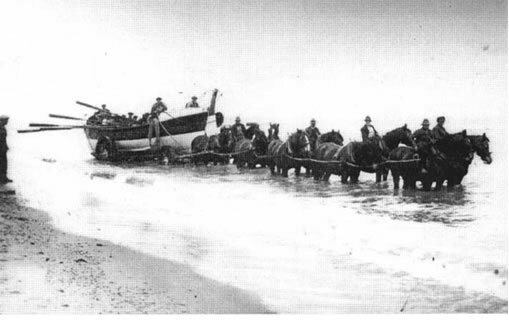 Six more horses were hooked on, with a single horse leading, to take the boat into the sea. To avoid sending the animals into very deep water, they were shackled on to the back wheels of the carriage. The hardest work was pulling the boat back up to the Lifeboat House, and for this two more horses were used, making ten in all. Eight horses were generally used at a practice. 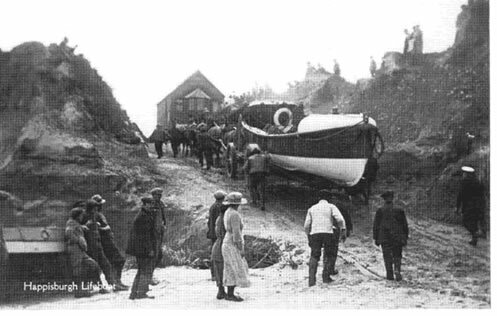 PICTURE – Preparing to pull the Jacob and Rachel Valentine back to the Lifeboat House. A practice launch was carried out four times a year. 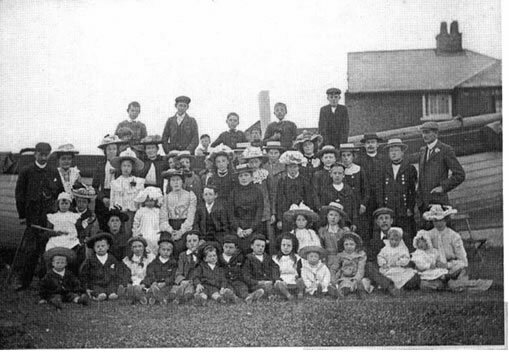 The August Bank Holiday launch attracted a crowd of visitors as well as local people, and was an important event in village life. Mr William Wilkins was in charge of the horses at every launching from the opening of the station in 1866 until his death in 1890. His service was recognised by the R.N.L.I. with a gratuity of £5 to his widow. PHOTO The August Bank Holiday launch. PHOTO – The crew of the Jacob and Rachel Vallentine. 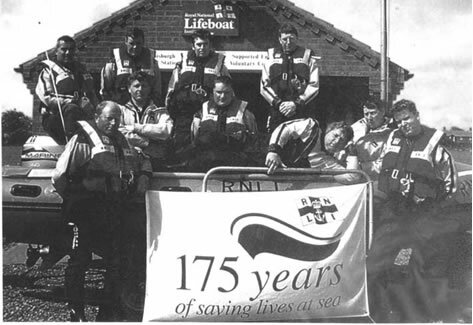 PHOTO – The crew in 1999 celebrating the founding of the Royal National Lifeboat Institution in 1824. 1965 An Inshore Lifeboat Station was established here to deal with swimming accidents and small craft capsizes during the summer months. Inshore boats can be launched with the minimum of delay. They can do well over 20 knots and can keep up this speed for at least 2 hours. Their normal crew is two and they can carry up to ten people. 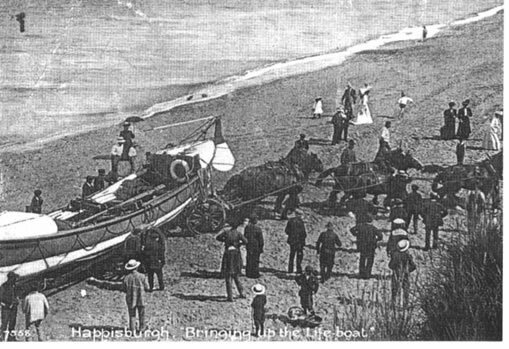 The first Inshore Lifeboat at Happisburgh was funded partly by Norwich Round Table No.1. 1973 A new boat. was given by Biggleswade Round Table. 1987 The Leicester Branch of RNLI paid for replacement. 1994 The Colin Martin, given by members of his family, is the boat in use today. It is now in service all year. Permission for the boat to be launched is given by LB Secretary in co-operation with the Coast.guard. The crew are called out by paging, with two maroons as back-up. The Air-Sea Rescue Service based at Wattisham, Suffolk is also called out. The yellow search-and-rescue helicopter takes between 30 and 40 minutes to reach the coast. Conventional life-boats, which are built to cope with the worst conditions, are not the ideal craft for going to the help of bathers, canoeists or dinghy sailors who get into trouble on a summer’s day. Few conventional life-boats have the speed for this kind of rescue. Because of the growing seriousness of the problem, the R.N.L.I. decided in 1963 to introduce experimentally a new type of rescue craft. This was the inshore lifeboat. Now they are in wide service with the Institution. The boats can be launched with a minimum of delay. Their normal crew is two, and they can carry up to ten people. Standard inshore lifeboats (or ILB’s) are driven by an outboard engine, usually of 40 HP. They can do well over 20 knots and can keep up this speed for at least two hours. The boats have five separate buoyancy compartments. They can strike rocks, piers or other craft without serious damage. The fabric is exceptionally tough, being Neoprene proof nylon.